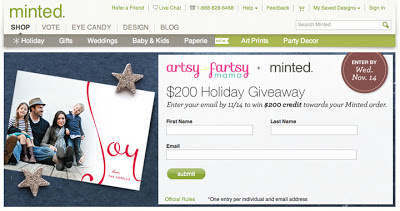 I am over"joy"ed about this giveaway from Minted! If you haven't already ordered your holiday cards, you're in luck. Even if you have, that's okay! 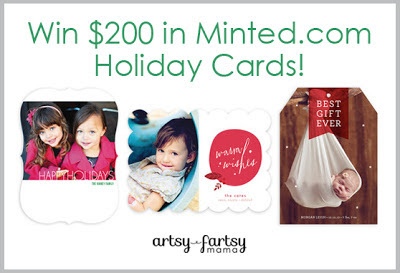 You just might want to find more friends to send cards to this year because one lucky Artsy-Fartsy Mama reader is going to win $200 toward Minted holiday cards!! I'm not going to lie - it's going to be tough to make a decision on a card design. The card designs are sourced from independent designers through design competitions. They are then voted on by the public to choose which designs are offered on Minted's site. What does that mean, you ask? It means that Minted only offers you the best to pick from. Which also means you can't go wrong with any choice you make! Not only are the designs great, Minted has also added fun holiday card shapes this year! There are nine shapes to choose from on most cards. I also love the backer options on the cards, and the customization you can add to envelopes to match your card design. Just adds that little extra to make your cards stand out. 2. Come back here and let me know what design(s) you would choose if you won! Enter by November 14th. 1 entry per person. More giveaway details and rules are located on the Artsy-Fartsy Mama/Minted giveaway page. I would select the Holiday Map Postcards for our Christmas cards...love them!!! Can I tell you the top 3? I really can't decide yet and it would depend on how many pictures I could actually use...Urbane Christmas, InstaChristmas, or Naughty or nice?. I could look at those cards all day. Thanks! I like the Merry and Bright Sparkles card. I usually design our holiday cards, but I would LOVE to win this package instead ( mama needs a break!). The Map postcards are perfect! I would honestly pick any of these designs and here is why: I have never ever sent out holiday cards before but have always wanted to! They have always just been too costly! Now that we have a new baby and are a complete family of 4 I think it would be a beautiful thing to do! I like the Merry Everything. I has 3 spots for each one of my kiddos, and I like how it seems to cover everything! Love them all . . . really like the Family Year in Review! It is so hard to choose but I love the Merry Typography Holiday Photo Card! I really love all the designs! But if I had to pick one it would be the White Christmas holiday card. I am in love with the Family Year in Review cards!!! They are AMAZING!!!!! I really like the Glitter Holiday Photo Cards. Love them all! I think it would depend what photo I ended up choosing. I love the Be Joyful one as well as the Family Year in Review. What amazingly beautiful cards and I love how different and fresh they are! I love the O Tannanbaum and Rejoice Christmas cards! Thanks for the great giveaway. I love the Be Joyful card-super cute! I love the Merry and Bright Sparkles! So cute! I LOVE Minted.com!! My favorite design is Merry Scriptmas! I love the timeline style back on them too! That is a MUST! My friend shared this site with me a couple weeks ago and I am addicted. I want to have a baby just to order the announcement cards. (but don't worry I wont). I will just send my expecting friends here just so they can send me the cards! Love this site, and I can't wait to get my card together!! Wow so many beautiful choices. I like Festive Joy Holiday Photo Cards by Cecile Paper Lounge and Glitter Holiday Photo Cards by Jen Soll. The holiday maps are great and maybe journals for all of my nieces. I like the Loopy Holiday Photo Cards, but there are so many great options. I love the "Wonderful Life" design! Very pretty. I'd choose the Red Wreath Christmas photo cards. What an awesome giveaway!! I love the Merry Typography Holiday Photo Cards! I LOVE, LOVE the Joyeux Noel one. This is an awesome giveaway, thanks Lindsay!! I really like the be merry berries holiday photo cards - so beautiful !!! I think the North Pole Form card is too cute! I'd get the Come, They Told Me cards.